For several years, I’ve written a blog post on our annual event advertising results. Past ones can be found here, here, and here. Many of those take-aways still apply, but rather than reiterating previous lessons, I wanted to take a newer, lighter approach to this review. It will be less big picture and instead show you a few head-to-head comparisons. On Facebook, we ran this ad to two vastly different audiences. “A” had a higher click-through rate, but also a higher cost-per-click. 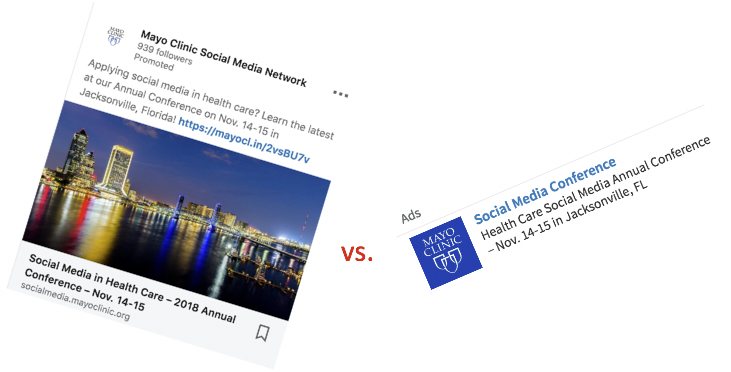 On LinkedIn, we tested these two advertising types: sponsored content and text ads. Keep in mind that these two different ad types appear in very different locations. In this case, the sponsored content (A) had the highest click-through rate, but using Google Analytics, we learned these people ended up spending the lowest time on site and had the fewest pages/session (out of all 5 of our LinkedIn campaigns). We stopped the sponsored content advertising early. On LinkedIn, within the text ad type, we tested multiple images in three different campaigns. 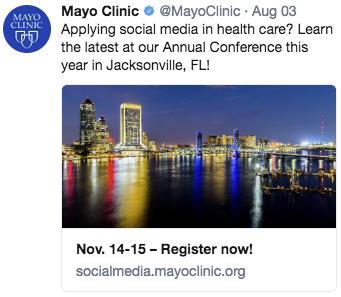 In all three cases, the Mayo Clinic logo was performing better than the Jacksonville images, and therefore was delivered much more. Keep in mind that LinkedIn text ads are unique, in that they lack the typical association with a brand page allotted to other platforms and ad types. Without the logo, it’s not visually evident that text ads are coming from Mayo Clinic. If I were to run LinkedIn text ads for a future conference, I would skip the non-logo images altogether. On LinkedIn, we also compared the more general event announcement ads referenced above to a particular ad promoting one keynote presentation. The keynote ad had a much lower click-through rate (75% less) and a higher cost per click (62% higher), but those metrics were largely counteracted by the Google Analytics metrics. Those who clicked through on the keynote ad spent much more time on site (132% more) and averaged more pages per session (10% more). So, while it cost more on the front-end, it seems to have yielded more later. On Twitter, we compared using a Twitter card without having a link up in the text versus tweeting a regular post with the link up in the text. The Twitter card (A) had a click-through rate more than double that of (B). Since Twitter optimized delivery to the one that was performing better, the Twitter card (A) got 3257% more impressions, which yielded more clicks. On Twitter, we also compared various versions of general event promotions with ads highlighting Susannah Fox' keynote presentation. We tried various audiences for the general event promotions, but for the aforementioned keynote ad, we targeted @SusannahFox follower look-alikes and those using keyword @susannahfox already. The Susannah Fox ad campaign had the highest click-through rate, which seems to make sense, as the audience should have been narrowly targeting people already interested in her and/or similar accounts. Once viewers clicked through to the event page on our website from the Susannah Fox ads, we also saw the most pages/session and highest average session duration in comparison to any of our other Twitter ads. 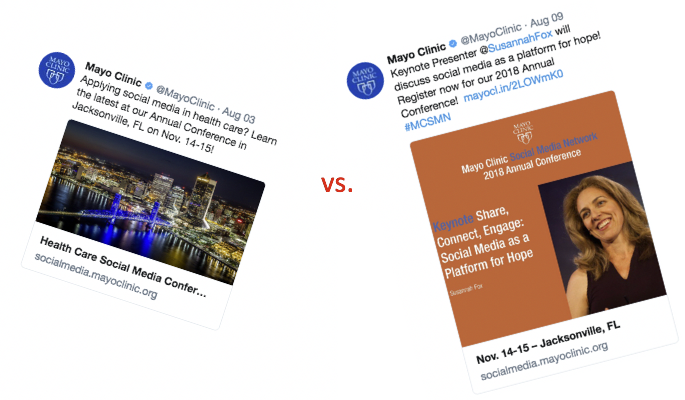 For future events, I want to consider highlighting keynote presentations more, especially if the speakers already have a strong social media presence, and if health care social media represents a significant portion of the keynoter’s online persona.